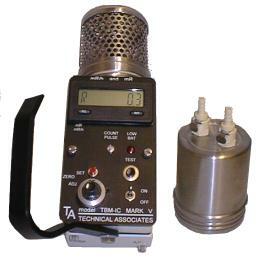 Home :: Portable Radiation Detectors :: The Frisker - Pancake Radiation Detector. The Frisker - Pancake Radiation Detector. 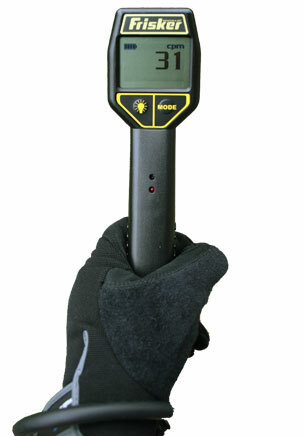 The Radiation Alert® Frisker is a handheld, wand-shaped radiation detector, featuring digital display and an internal pancake G-M. 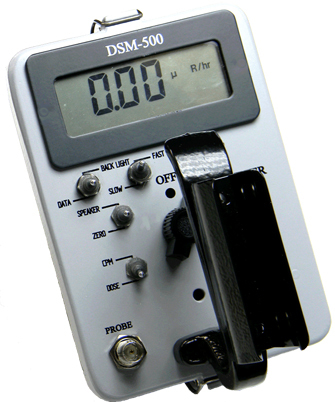 This detector is ideal for general purpose survey in laboratory use, nuclear power plant frisking, emergency response, border patrol, customs inspections, airport security, and other applications. Halogen-quenched pancake GM tube with thin mica end window. Mica window density 1.5-2.0 mg/cm2. Effective window diameter is 45 mm. Side wall is .012 inch thick. Typically ±15% from factory. , ±10% (NIST). Detects alpha down to 2.5 MeV; typical detection efficiency at 3.6 MeV is greater than 80%. Detects beta at 50 keV with typical 35% detection efficiency. Detects beta at 150 keV with typical 75% detection efficiency. Detects gamma and x-rays down to 10 keV typical through the window, 40 keV minimum through the case. Readout will OVERRANGE in radiation fields as high as 100 times the maximum reading. Pulsating beeper sounds the alert. Adjustable alert levels are used for µR/hr / CPM, and nSv/hr / CPS. Backlit liquid crystal display with mode indicators. Red LED flashes with each count. Two (2) AA alkaline batteries. Battery life is approx. 200 hours at normal background radiation levels. Notify me of updates to The Frisker - Pancake Radiation Detector.